Cleaning fee is $ 75 in cash to pay the last day of your stay at the apartment. Very humble and old building. This is a vibrant area with many bars and clubs around. The Lower East Side is one of Manhattan's most fashionable neighborhoods with indie shops and some of the best restaurants in NYC. The Tenement Museum keeps the neighborhood alive through a series of guided tours of the world. Typical New York building. The Lower East Side is a very cosmopolitan area filled with good restaurants, bars and fashion boutiques. in the heart of New York. Typical very nice prewar New York Building. Amazing neighborhood near Many restaurants and metro. Rated by NYMAG as the 2nd best neighborhood in New York: http: // nymag. com / realestate / Neighborhoods / 2010/65374 / index1. html Typical New Yorker building. The Lower East Side is a very cosmopolitan and filled with good restaurants, bars and boutiques. He was elected 2nd best area of ​​New York by the New York Mag: http: // nymag. com / realestate / Neighborhoods / 2010/65374 / index1. html Metro station 30sec. Our family of four had a wonderful time while staying at Maki’s apartment. There was plenty of room for all of us. Conveniently located in Chinatown and close to Little Italy. There were a ton of awesome restaurants and shops very close by. We walked everywhere and loved all of the neighborhood playgrounds. There was plenty of grocery stores, and a Trader Joe’s near by if you plan on cooking. There is everything that you need in the kitchen to cook. We had a few evenings in and had no problem preparing our meals. Our kids loved that it was right next door to the Tattoo Parlor, the sign made it very easy to find the apartment all times throughout the day. Maki was a wonderful host. 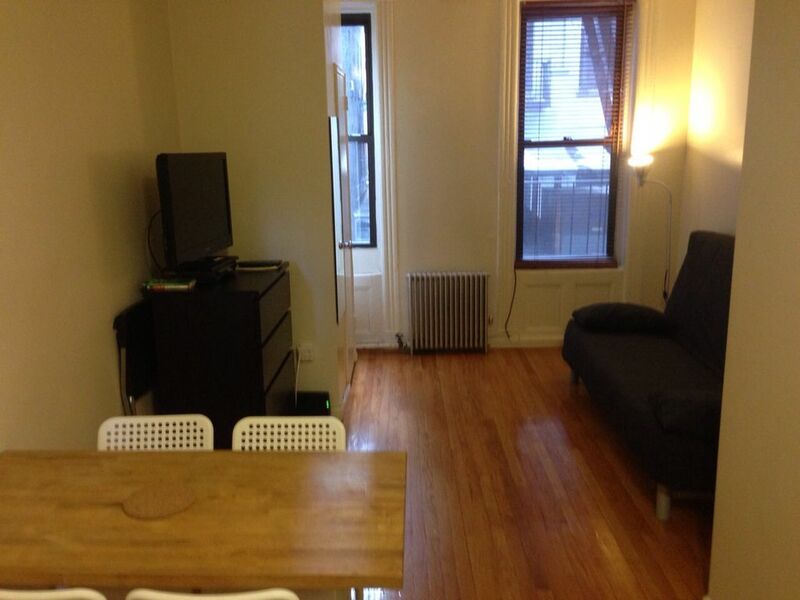 We definitely recommend this cozy apartment and will return the next time we are in New York. The apt itself was nice, clean, conveniently located. Maki was super responsive to any questions. The Bldg surrounding needs more gentrification. Also, the garbage from the Bldg Lobby needs a different home. Great location for getting around Manhattan, couple of mins walk to subway and walkable to East Village, China Town, Little Italy etc. Really easy journey to and from JFK by subway - air train to Jamaica and then 1 subway train to station literally around the corner. As previous reviews have stated entrance to building looks a little off putting but apartment is clean and quiet with everything we needed for a 5 day stay. We were there with our 14 year old son & 12 year old daughter and felt safe even walking around after 11 pm at night. Didn't need to contact Maki as we had no problems - would definitely stay there again. Apartment is very close to subway. Local shops and cafes near. It's warm and clean and well equipped. Owner is helpful but not intrusive. As others have said, it doesn't look great as you enter the building. So, first impressions arent so good when you arrive off the plane , but its no real problem. Everything was explained perfectly, price was great. The apartment was very clean. It was an excellent location, near the subways. I would stay there again. in the heart of New York. Typical very nice prewar New York Building. The Lower East Side is a very cosmopolitan and filled with good restaurants, bars and boutiques. IMPORTANT: Cleaning fee is $75 in cash to pay the last day of your stay at the apartment. If not paid, the deposit of 100euros will not be refunded. Price is negotiable for long term rental.